The Glynmill Inn has achieved landmark status in the community of Corner Brook, and is certainly the town's best-known building. It was designed by noted Halifax architect Andrew Cobb in 1923 and constructed by the English firm of Armstrong-Whitworth Co. That year Cobb had been commissioned by the Newfoundland Pulp and Paper Company to design the houses for Corner Brook, the largest commission of his career. A spot was reserved for the inn on the outskirts of Corner Brook between the town and the mill. Glynmill Inn is the finest example of the Tudor Revival style on the west coast and likely the entire province. To help remedy the shortage of local accommodations, the inn had originally been built as living quarters for the senior staff constructing the paper mill. It was officially opened in 1924 by Sir Glyn West, Chairman of Armstrong-Whitworth. When the mill became operational in 1925, the staff quarters became a hotel. The newly constructed building was partly destroyed by fire on January 30th, 1929 but was quickly rebuilt. When Atlantic Inns Ltd. acquired the hotel in 1974, they incorporated 30 bedrooms and meeting and banquet facilities into the original construction. In 1994 renovations were started to upgrade the hotel and modernize interior features for business and travelling customers. The result is a property which reflects a contemporary spirit, yet which retains a rich traditional heritage. Glynmill Inn is possibly the finest building of its type in Western Newfoundland, and one of the best examples of a Tudor-inspired building in the province. The original Tudor Style half-timbering is still in place. The interior design was influenced by the Craftsman Style and remains relatively intact with few alterations. Over the years, the hotel has welcomed many important persons including Princess Anne, Andrew the Duke of York, Edward the Duke of Wessex, Sir Eric Bowater, visiting heads of state, and various premiers of Newfoundland and Labrador. In addition, the inn has served as a focal point for many local organizations. The first adult education classes for the area took place in the building, and the local chapter of the Rotary Club has met in the inn since the chapter's inauguration. Glynmill Inn was designated as a Registered Heritage Structure by the Heritage Foundation of Newfoundland and Labrador on March 31, 2001. Of particular interest to the foundation at the time of the inn's designation was the fact that the building still exists in its original picturesque setting. The hotel sits on landscaped grounds with mature trees and flower gardens, as well as nearby walking trails and swan ponds. 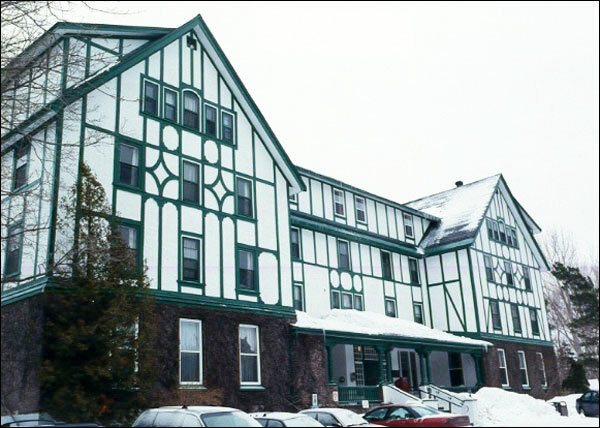 The hotel's designation as a Registered Heritage Structure was formally recognized by the Foundation at the Newfoundland Historical Society's "Woodland Echoes - The Forestry Industry in Western Newfoundland" Symposium in May, 2001. Also view Glynmill Inn Registered Heritage Structure on the Heritage Foundation of Newfoundland and Labrador web site. The Newfoundland and Labrador Heritage Web Site has on its site only a portion of the registered heritage structures in Newfoundland and Labrador. To view a complete list or search for a particular structure visit the Heritage Foundation's Property Search page.